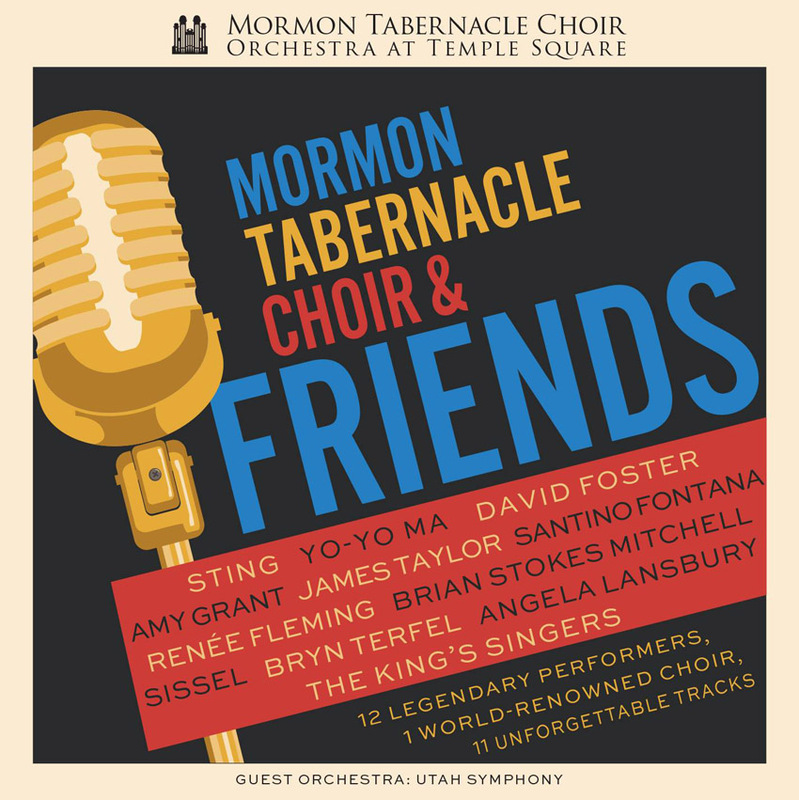 The Mormon Tabernacle Choir and Orchestra at Temple Square’s latest album, Mormon Tabernacle Choir & Friends, featuring 12 performers (including Sting, Yo-Yo Ma, James Taylor, Angela Lansbury, and more) who are considered dear friends by the Choir and are known the world over. This unprecedented collection of recordings is taken from standout performances delivered over the past 15 years, including the Choir’s performance of ”Fragile” with Sting, Yo-Yo Ma, and the Utah Symphony at the Opening Ceremonies of the 2002 Winter Olympic Games in Salt Lake City. Many performances were recorded at the 20,000 seat Conference Center on Temple Square in Salt Lake City. However, four new tracks were created specifically for this album, including new recordings with Amy Grant, Santino Fontana, Renée Fleming, and The King’s Singers. The Mormon Tabernacle Choir is a 360-member choir which has traveled around the world performing at the inaugurations of U.S. presidents, at World’s Fairs and expositions, in acclaimed concert halls, on television and radio broadcasts, and numerous other events. The Orchestra at Temple Square is a 150-member, all-volunteer symphony orchestra organized in 1999 to perform and accompany the musical ensembles of the Mormon Tabernacle Choir organization. With their incomparable medley of voices and instruments and their shared faith in God they are a significant, recognizable presence in the world of music, giving service through song. This newest release from the Mormon Tabernacle Choir is an enjoyable and uplifting album of some of the choir’s most popular and enjoyable performances. With accompaniment by the Utah Symphony and the Orchestra at Temple Square, the choir has gathered 11 entertaining songs featuring 12 of the most amazing performers to have appeared with the choir. The songs range from Broadway hits to popular and classical pieces, and include both highlights of previous performances as well as new recordings just for this album. Happily, this album includes one of my new favorite pieces, “Homeward Bound,” featuring Bryn Terfel. There is enough variety in this album to hold the interest of most musical tastes. It is a welcome addition to my music library as I am sure it will be to yours. Mormon Tabernacle Choir & Friends is available in CD format from Amazon.com and Deseret Book. A copy of this album was provided to me for review and my opinions are always just mine. And yes, if you click on these links to buy, you won’t pay a penny more, but you’ll help fund my music habit with a small commission from Amazon.